The Jiajing emperor was a faithful disciple of Daoism. The imperial partiality sparked a wave of enthusiasm for Daoist religion throughout the empire, and set a fashion in the decorative arts. Motifs relating to Daoism were most favourably employed in the decoration of ceramics as seen in this dish decorated in a rich blue with the motif of the Three Friends (prunus, pine and bamboo). The Three Friends are symbolic of independence, endurance and integrity. This new type of bright, strong blue was made from cobalt known as Mohammedan blue. 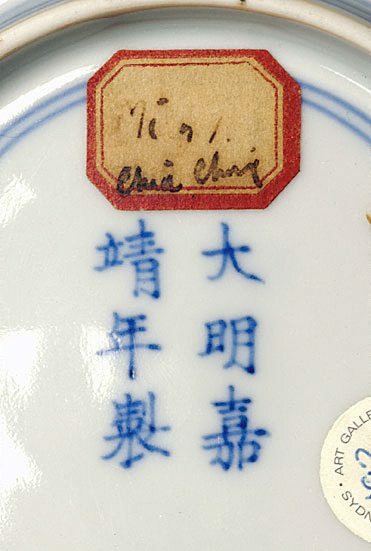 The Asian Collections, AGNSW, 2003, pg.121. 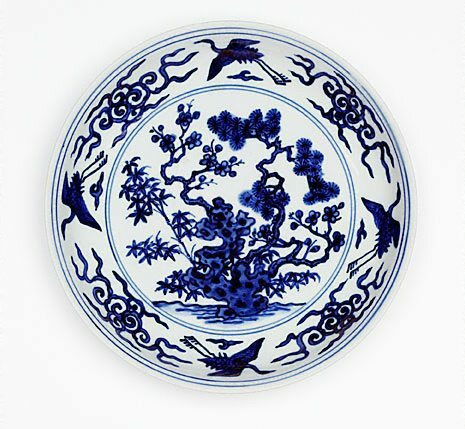 The Asian Collections Art Gallery of New South Wales , 'The Marvel of Porcelain', Sydney, 2003, 121 (colour illus. ).